High levels of efficiency, alternating temperature conditions, and frequent load changes – hydraulic systems of stationary and mobile working machinery are subject to continuous loads. To ensure the greatest possible functionality long-term, corrosion-resistant and precise connection technology is indispensable. Small components with big system function: The process reliability of hydraulic connection technology is crucial for the effective and economical operation of modern working machinery in all sectors. A central aspect here is the pursuit of greater energy efficiency – yet the loads in fluid technology also rise as efficiencies increase. To ensure that systems subject to permanent stress – such as plastic injection molding machines and large excavators in mining – can also function under tougher conditions, components are needed that correspond to the requirements for the leak safety of connection points, while providing effective corrosion protection. For the user this means: Besides a choice of system-compatible connecting components, the focus is on correct assembly and the selection of a competent supplier. VOSS Fluid GmbH is a manufacturer of pipe connecting systems and a system partner to international mechanical engineering. The product portfolio comprises tube connections for stationary and mobile hydraulics, including cutting ring and flanged screw couplings, tube forming systems, flange couplings, valves, and accessories. 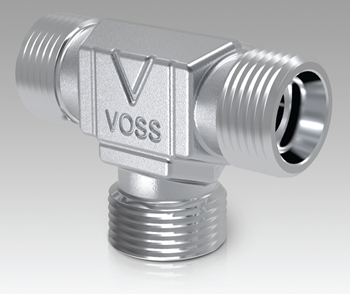 VOSS Fluid has longstanding expertise in the production of customized connecting parts, enabling it to implement this effectively in the development of system solutions and technical advice for its customers. The result: consistently high-quality components, a high level of corrosion protection, time-efficient assembly capability of the components, and hydraulic systems with long-term leak tightness. A central, qualitative condition is the coating of the tube connections. This is a prerequisite for permanent corrosion protection along with functionally stable and hence economic components: VOSS Fluid utilizes its in-house, sustainable zinc-nickel base coating VOSS coat for all tube couplings. These fulfill all specifications of the EU End-of-life Vehicles Directive, which has prohibited surfaces containing chromium VI since 2007. Together with independent research institutes and universities (for example Aalen University of Applied Sciences), a corrosion protection has been developed that is around ten times better than conventional zinc coatings in comparison to the base coats. In contrast to purely zinc surfaces, zinc-nickel does not form any distinct white rust during corrosion, but instead only a slight gray haziness. The values are 50 times below the limit values stipulated in EU Regulation 1907/2006 for determination of the nickel release of products coming into direct and prolonged contact with the skin. When comparing the VOSS coat surface directly with a 2-Euro coin, this fell below the limit value by 2230 times. The surface is not only environmentally compatible due to the hard nickel content, but also more wear resistant against the mechanical loads to which hydraulic couplings are exposed during transport and assembly through to practical application. VOSS coat consists of a zinc-nickel base coat, which is then passivated and finally sealed. These three layers prevent corrosion of the base material and enhance the connecting components in a sustainable way. According to VDMA Standards Sheet 24576, the zinc-nickel surface attains the highest corrosion resistance class K5. This denotes the protective capacity of the surface, which exhibits resistance a minimum of 720 hours against red rust and at least 360 hours against white rust. Under laboratory conditions with non-assembled parts, corrosion resistance of more than 2000 hours was attained in the salt spray test according to DIN EN ISO 9227. In the practical test with random goods from current production, they did not reveal any base metal corrosion even after 1000 hours of handling and assembly. For optimum assembly torques, the friction coefficients are continually improved in development and production for cutting ring couplings: That means they are significantly lower than for other zinc-nickel coatings. Depending on the connecting component, a lubricant and partial inner coating are used, for example union nuts. Experienced application technicians support assembly-reliable production processes at the customer facility. These technicians accompany fitters and maintenance personnel – from selection of the system-compatible hydraulic coupling and training covering all aspects of leakage-free couplings through to regular assembly audits. The company-internal electroplating forms the basis for the high-quality coating of tube connections. This plant corresponds to a high technological standard as well as the current environmental provisions for mixed residential areas. It is also one of the most modern plants in Europe and is ideally designed for the internal process steps during coating – this high degree of specialization would not be attainable via outsourcing. In contrast to normal coatings, the process is optimized in respect to component damage prevention, layer distribution, visual appearance, and friction coefficients – qualitative reproducibility of the 6600 different articles from which the larger product spectrum is derived is always guaranteed. Weight, size, geometry – these are only some of the on average twelve program parameters saved for each article in the production system. They are an important prerequisite for optimally coating the different connecting parts on a recurrent basis. Current strength during electroplating, retention time in the basin, and handling are clearly defined specific to the article. The frames and baskets used for transporting the connecting parts in the plant are in-house developments. Larger connecting parts with up to 2.5 kg weight and sensitive outer threads are placed manually on frames by personnel, thereby preventing potential damage to the thread during the coating process. 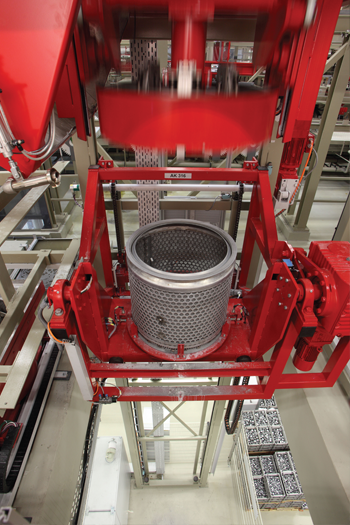 During pretreatment, the articles are cleaned via ultrasound in order to remove any dirt in the bores. Smaller components are fed to the process via drums. The filling cycle utilizes a conveyor belt in order to minimize falling heights and prevent process-related damage. A significantly reduced coating time also conserves the material. For resource-efficient production, the entire electroplating process is controlled and monitored via online analysis and sensor systems. Automatic dosing pumps ensure that the correct amount of chemicals is always supplied specific to the product. The baths thus remain stable within the specified process limits. The chemicals are continuously kept in motion to ensure they are distributed evenly. After the electroplating process, the layer thickness and nickel content are monitored for each production batch. This means the articles receive a verifiable even coating with VOSS coat, which permanently protects them against corrosion. A pilot electroplating has been operated since 2013. This enables theentire electroplating process to be mapped in miniature form, while simulating production parameters modified to save resources. Besides the refinement of VOSS coat, optimization of the internal processes in relation to efficiency and sustainability are also integrated here. 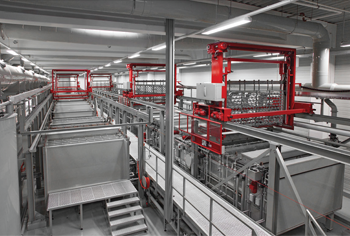 Users therefore benefit from a future-oriented surface coating and customized system solutions. The quality of the products, their dimensional accuracyand hence their process-reliable application do not solely depend on the electroplating system. The high product standard begins with the selection of the raw material, which is procured exclusively from audited partners. For example, the composition of the materials is determined via spectral analysis for incoming goods, while the geometry of the goods is ascertained using an optical profile projector, contour measuring device, or depth gauge. Hardness measurements and the elastomer testing for e.g. sealing rings are also conducted here. Another special feature is the machining feasibility inspection, which all articles undergo so as to ensure a consistently high product quality. A statistical process control (SPC) is used to monitor each production batch – both in machining as well as during coating. The tool wear is continuously monitored during machining. As the sister of VOSS Automotive, system solution provider for the international commercial vehicle and car industry, VOSS Fluid pursues a zero-fault strategy in order to meet the increasingly complex requirements of fluid technology. The process reliability of hydraulic systems in mobile and stationary working machinery depends on the choice of suitable tube connecting systems for the relevant application, its corrosion resistance, and correct assembly. 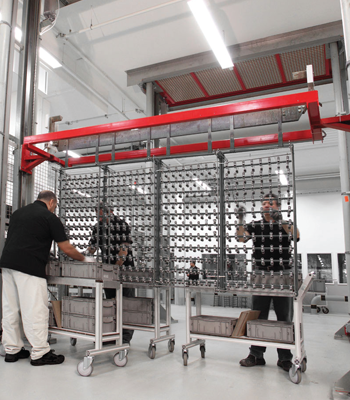 VOSS Fluid GmbH lays the cornerstone for this with its consulting and application expertise: Assembly-reliable production processes are ensured by accompanying customers through the technical stages of project configuration, engineering, and assembly. Thanks to specially developed zinc-nickel technology along with state-of-the-art production and quality standards, users receive tube connections with optimum assembly torques and a high level of corrosion protection. The result is durable machines as well as a process-reliable and economic hydraulic system.